In “Civilization of China” (1911), Herbert Giles wrote that “for pleasure pure and simple, independent of gains and losses, the theater occupies the warmest place in every Chinaman's heart”. The fact that the Chinese theater is also known by the name guo cui (“quintessence of the nation”) solidifies its prestige as the most important form of entertainment in China where it has been for centuries. Chinese opera is one of the three oldest dramatic art forms in the world—the other two being ancient Greek’s theater and Indian Sanskrit opera. The roots of Chinese opera go back to the early periods in China and gradually evolving over more than a thousand years, reaching its mature form during the Song Dynasty in the 13th century CE and becoming fashionable in the Qing Dynasty (1644 - 1911 CE). It was popular among ordinary people who would watch performances in tearooms, restaurants, and makeshift stages. These days, local operas are found in every part of China where they are performed according to local musical styles and in regional languages. Indeed, the staging itself is simple: actions occur on a bare stage except for a backdrop and simple props. A table and several chairs can indicate a throne, wall, mountain, or many other locations. The actors’ costumes and makeup identify standard character types which are immediately recognizable even to foreigners. However, behind this simplicity lies decades of training, strict visual etiquette, and layers of symbolism. According to Liji (“the Book of Rites”), a collection of texts describing the social forms, administration, and ceremonial rites of the Zhou Dynasty (1046 - 256 BCE), children at the age of thirteen had already learned to dance and sing. Most forms of Chinese opera owe their performance styles and their plot-lines to the musically fertile Shanxi province. Plots in Shanxi Opera often deal with fighting oppression, wars against the northern barbarians, and issues of loyalty. Some Shanxi Opera productions include special effects such as fire-breathing or acrobatic twirling, in addition to the standard operatic acting and singing. An early form of Chinese opera, originating from the Later Zhao Dynasty (319 – 351 CE), was a simple comic drama involving only two performers who are thought to be the forerunners of the comic characters of later Chinese opera. During the Han and the Tsin (265 - 420 CE) Dynasties, new dances were introduced. Evidently, the new dances were proven to be popular as they gradually became an artistic achievement enjoyed by high society. Ming Huang, Emperor of the Tang Dynasty (618–907 CE) acquired a concubine name Yang Yuhuan who soon learned to dance many pieces that delighted him. The Emperor then decreed that a group of boys should be trained in the li yuan (“the pear garden”) of the inner court to do choral dances with girls from the palace. After that, the name "li yuan" was used to refer to the theater, and líyuán dìzi (“Children of the Pear Garden”) became the general name for actors and actresses. 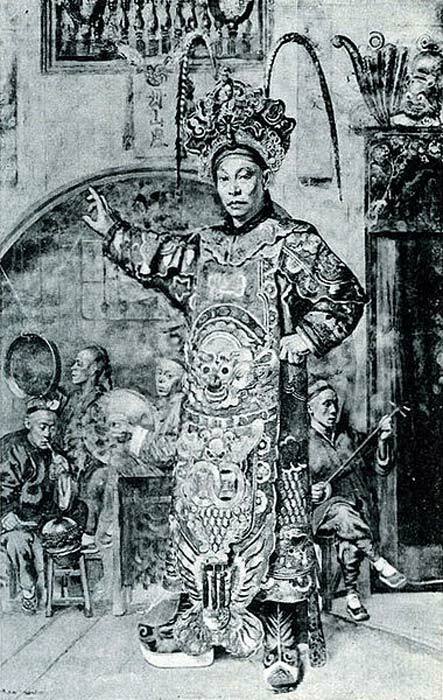 To this day, Emperor Ming Huang himself is worshiped as the patron of Chinese opera. 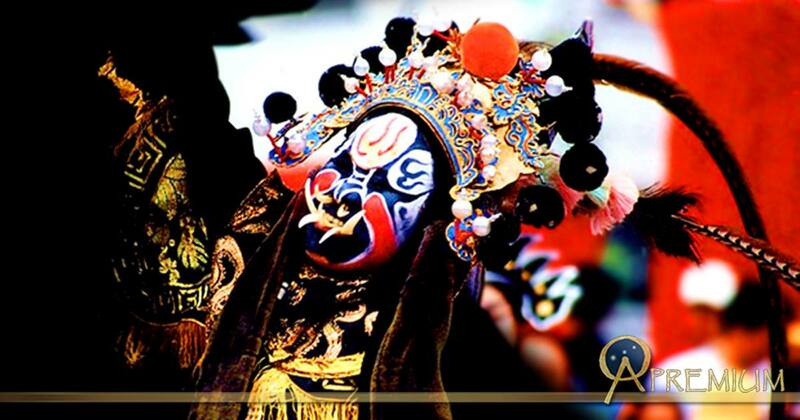 The art of facial makeup in Chinese opera also has a long and dramatic history. In the Spring and Autumn period (770 – 476 BCE), people in the two kingdoms of Wu and Yue, two warring states in the lower reaches of the Yangtze, dyed their faces and skin with various colors wore animal hides and birds' feathers and blackened their teeth. These decorations evolved into masks worn at war or at festivals to worship gods and drive away monsters. 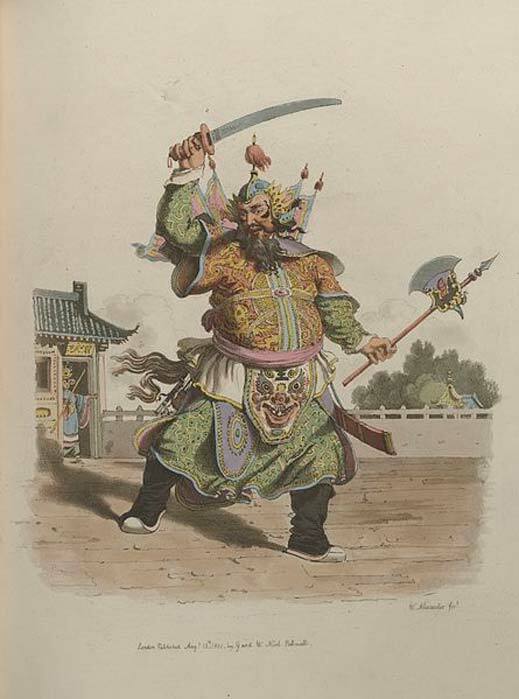 In the Han Dynasty (207 BCE - 220 CE), actors wore beast-head decorations in operas.